Monday’s Pioneer Press headline frames 15 as a question of balancing the city budget. But what’s the article really saying? The article reports that increasing the wage would mean raises for many “clerical trainees, interns, lifeguards, custodians, library aides, fire medic cadets and other entry-level and part-time or seasonal employees,” totaling more than $2 million. In other words, the city is paying poverty wages for many of the critical jobs that make Saint Paul run. The article plays up the impact of the increases in the Parks and Rec budget, saying “the vast majority — $1.8 million — would come from the parks and rec budget for parks workers and lifeguards.” But the article also reveals that “For perspective, that’s less than 1 percent of this year’s total city spending on salaries — $218.4 million — and fringe benefits — $96 million.” While some city employees make great salaries and benefits, hundreds of seasonal Parks and Rec workers make poverty wages. For even more perspective, consider the $51.4 million Saint Paul paid for CHS Field.City Hall throws millions at a ballpark, but agonizes over paying a living wage to the workers who make Saint Paul parks a place for our families to grow, play and relax. 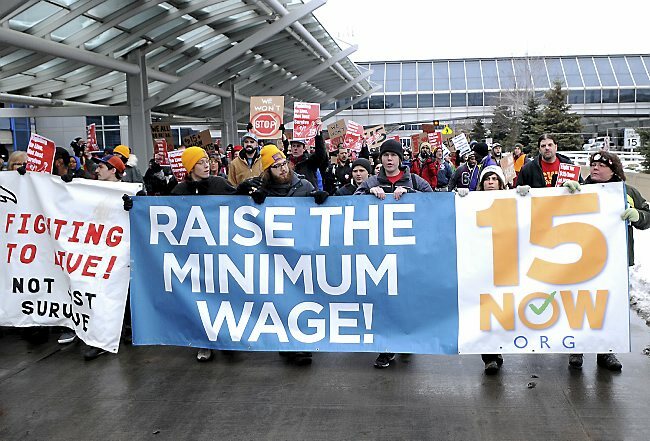 Alarmist headlines like the Pioneer Press’ obscure the reality that Saint Paul has enough to pay every city employee a living wage and benefits. We can’t let our city government hide behind excuses-- city employees need a raise! Read the full article here, and come to our 15 Now meeting next week to hold the City accountable to paying every employee a living wage!